A delicate little button of goat cheese, barely protected by the very thin Geotrichum rind, which arrives in its own convenient wooden box. 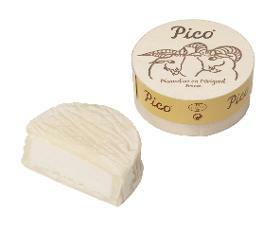 Pico comes from Perigord, home of French truffles and a few remarkable goat cheese producers (the Loire Valley being the typical source of all things chevre). Just beneath the rind, this cheese has a scant oozing layer, and in the center the texture remains chalky and moist. Its flavor is lactic and grassy-sweet with a hint of salt and scant barnyard notes.